So, like I've already mentioned, next week I'll be in both London & Frankfurt for signings, book fairs, and the like. And since I just received my finalized schedule, I thought I'd share some of it with you in case you can make it to one of the events. Though I should note that the London activities are mostly limited to interviews, etc, including the Wimbledon Bookfest which is limited to the students. And while Frankfurt is mostly relegated to Book Fair attendees, there are also two public signings that I'm really looking forward to and would love to see you there! 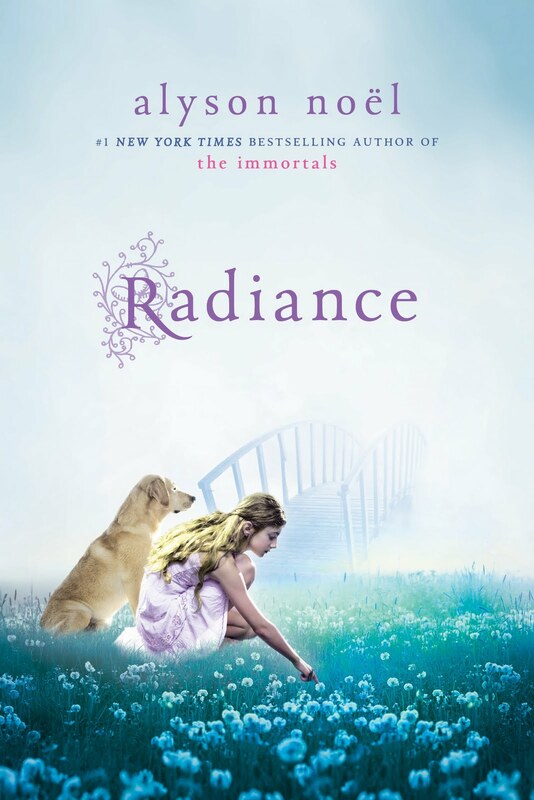 Also, just wanted to say THANKS for keeping RADIANCE on the New York Times Bestsellers List for the 4th week running--you guys rock!! Smart Chicks, London, Frankfurt, & More! Playing a little game of catch up here after two weeks away and wanted to let you know that the first chapter of NIGHT STAR as well as the title of the 6th and final Immortals book will be sent to all those who subscribe at The Immortals site HERE! Also, for my UK readers who've been asking, I just learned that RADIANCE is coming to your shores on 02.04.11, with SHIMMER to follow on 08.05.11! And speaking of the UK, I'll be in London next week signing books at the Wimbledon Bookfest and giving various radio interviews before I'm off to the Frankfurt Book Fair on Wednesday--it's been ages since I was last there and I seriously can't wait to see all of you! Oh, and a brand-spanking-new Immortals UK Facebook page just went up--you can join by clicking HERE! Also, for my friends in Chile, a new Chilean Immortals site is up--you can see it by clicking HERE! And speaking of France (we weren't but please try to pretend that we were), below is the French Cover of SHADOWLAND which hits stores in October! And I'm also thrilled to announce that French translation rights for SAVING ZOE, KISS & BLOG, CRUEL SUMMER, LAGUNA COVE, & FAKING 19 have been sold as well! Does this mean a Parisian signing might be in the works???? Speaking of covers--below are the Slovenian covers for EVERMORE, BLUE MOON, & SHADOWLAND (in that order)! And now, I'll leave you to watch a hilarious reenactment of SHADOWLAND that aired at the Teen Read Awards in Toronto--just click HERE to see it! Thanks To YOU The Smart Chicks Really Did KICK IT!!! The last two weeks were exhilarating, exciting, and yeah, a little bit exhausting as well, (courtesy of all those early morning wake-up calls! ), though it was truly amazing to see what started as a seed of an idea (Melissa Marr's truly awesome idea!) blossom into a full-blown tour of epic proportions! 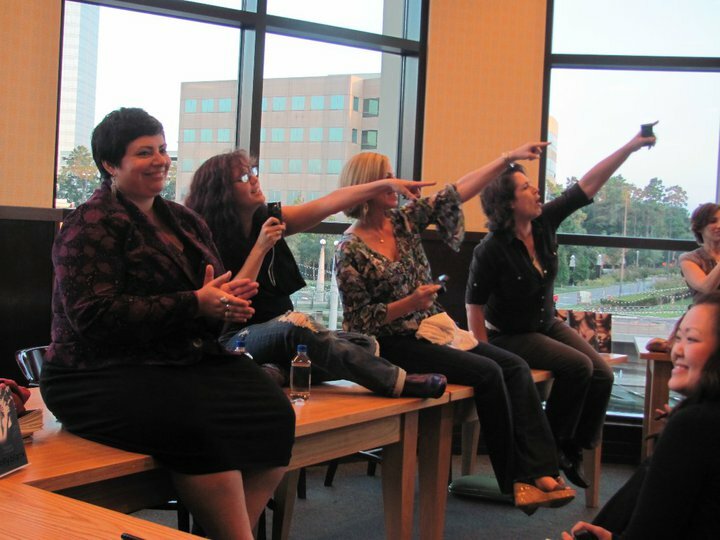 While groups of authors touring together is nothing new, what was different about The Smart Chicks Tour was that it was fully author organized and financed. Corralling all those authors into all those cities was no easy feat, but thanks to the efforts of Melissa & Kelley & the rest of the amazingly talented Smart Chicks (in addition to writing incredible books they served as artists, tech specialists, and spread-sheet commandos!) it went off without a hitch. And I know I speak for all of us when I say THANK YOU to all of you who traveled to see us--many of you from great distances--and for all the enthusiasm, kindness, and generosity you brought along with you--it was truly appreciated! For those of you who missed it (as well as those of you who'd like to relive it!) you can read all about it and watch video footage on the Smart Chicks Blog. Thanks again for making this tour so amazing! 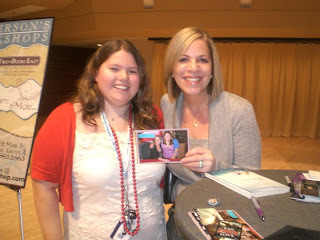 Me and Allie posing with a picture of the two of us at my Dark Flame signing when the lights went out! The Chicks in San Diego! Scottsdale made Smart Chicks Tattoos available--sooo cool! Surrounded by Jessicas in Mississippi--including Jessica Verday on the far right! So many of you made your own amulets a la the cover of Shadowland necklaces and they were amazing!! Backstage in Austin with the Girls in the Stacks! Kelley Armstron, Me, Melissa Marr at the kick-off in Austin! Smart Chicks Kick It in Brampton, ON! and we really hope you can make it! @ CHAPTERS BRAMPTON in Brampton, ON today @ 2 PM. Special thanks to all of you for making this tour such a blast--I've enjoyed meeting and chatting with so many amazing readers. And I can't wait to see YOU today! Smart Chicks Kick It in Cincinnati! 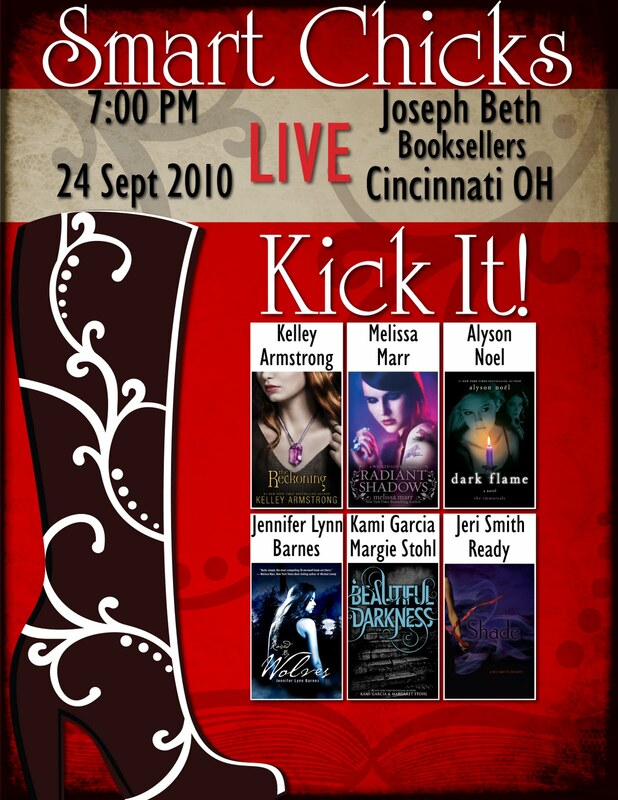 The Smart Chicks are in Cincinnati today, September 24! & we really hope to see you there! Smart Chicks Kick It in Dayton! 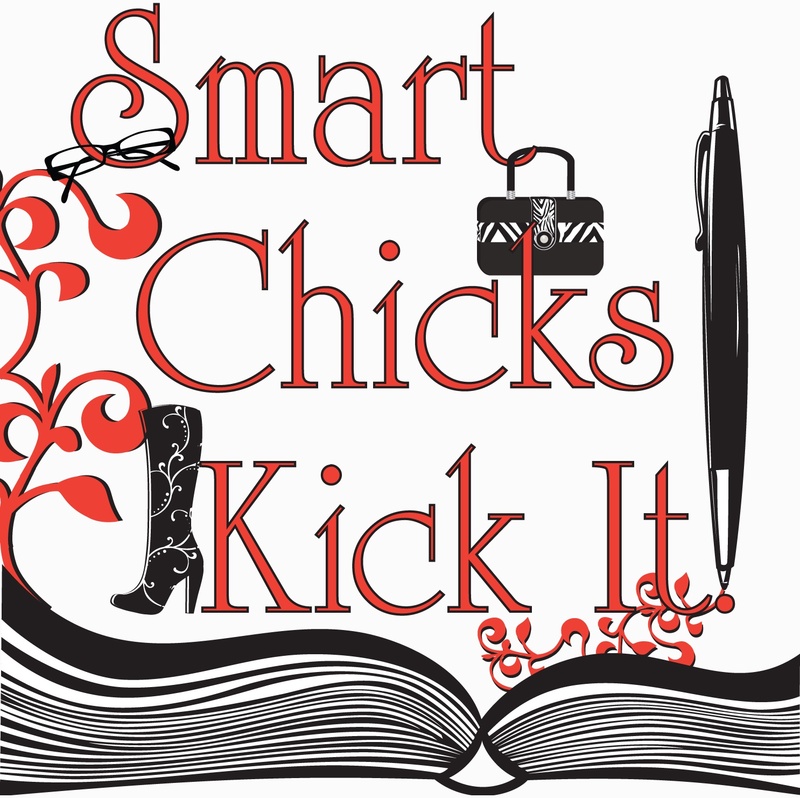 The Smart Chicks Kick It Tour continues in Dayton, OH today, September 23! 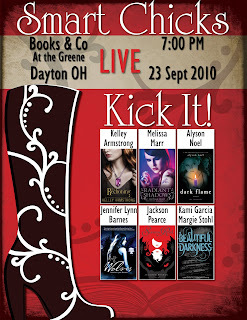 I hope you can join us today @ 7 PM @ BOOKS & CO AT THE GREENE, Dayton, OH. Kami Garcia and I will be there. Can't wait to see you! 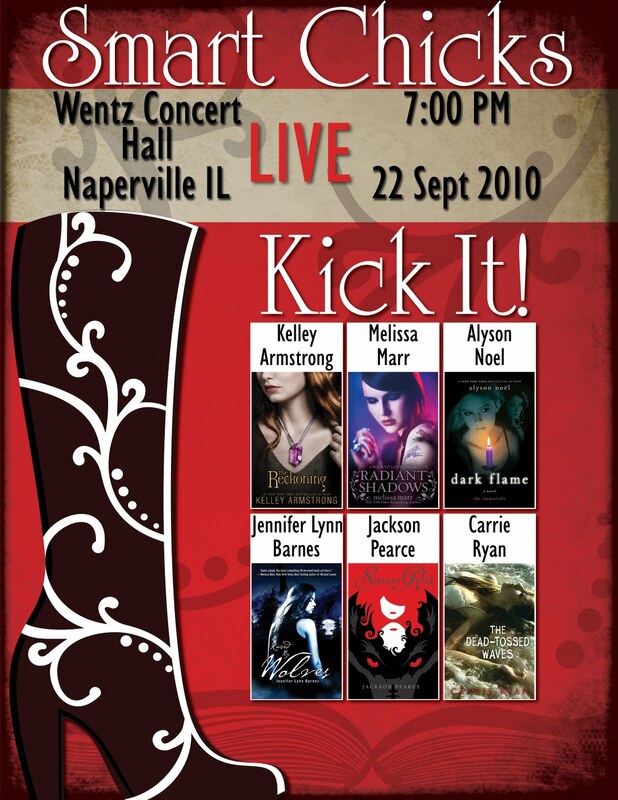 Smart Chicks Kick It in Naperville! Kelley Armstrong, Melissa Marr, Jackson Pearce, Jennifer Barnes & Carrie Ryan. for a special event hosted by ANDERSON'S Naperville, IL. 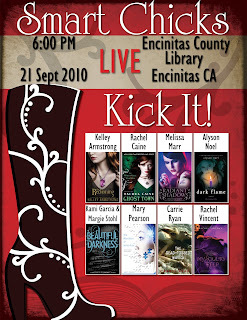 Smart Chicks Kick It in Encinitas! 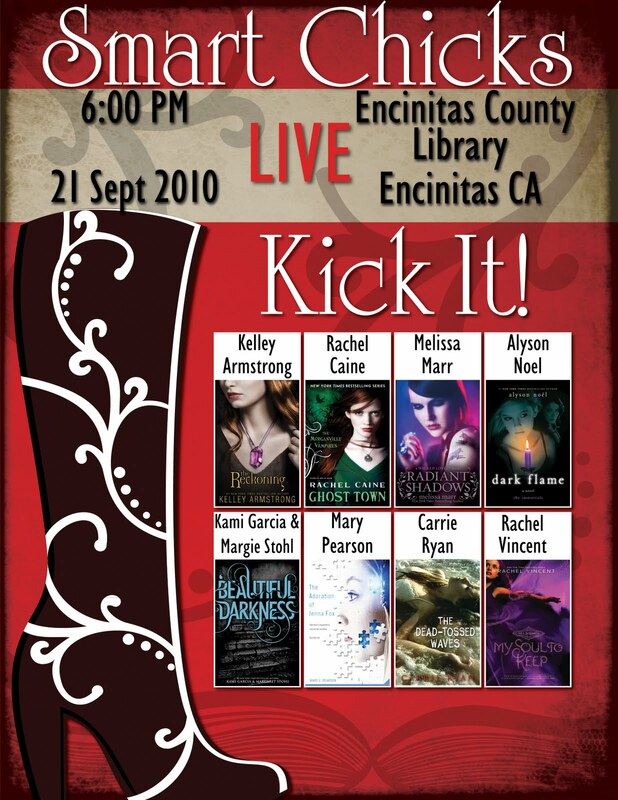 The Smart Chicks (Melissa Marr, Kelley Armstrong, Mary Pearson, Rachel Caine, Rachel Vincent, Carrie Ryan, Margaret Stohl, Kami Garcia & I) are on our way to Encinitas, CA! for an amazing event hosted by MYSTERIOUS GALAXY! Smart Chicks Kick It in Pasadena! 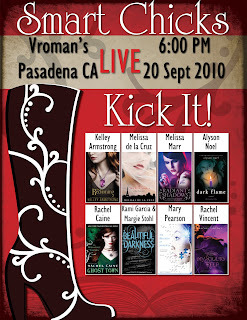 @ VROMAN'S in Pasadena, CA today, September 20 @ 6:00 PM. Hope you can join us! Smart Chicks Kick It in Menlo Park! The Smart Chicks are kickin' it in Menlo Park, CA today! Be sure to stop by the Menlo Park Library today, September 18 @ 6:00 PM. for a special event hosted by KEPLERS. 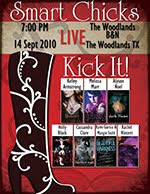 Melissa de la Cruz, Margaret Stohl, Kami Garcia & Kimberly Derting. Smart Chicks Kick It in Scottsdale! 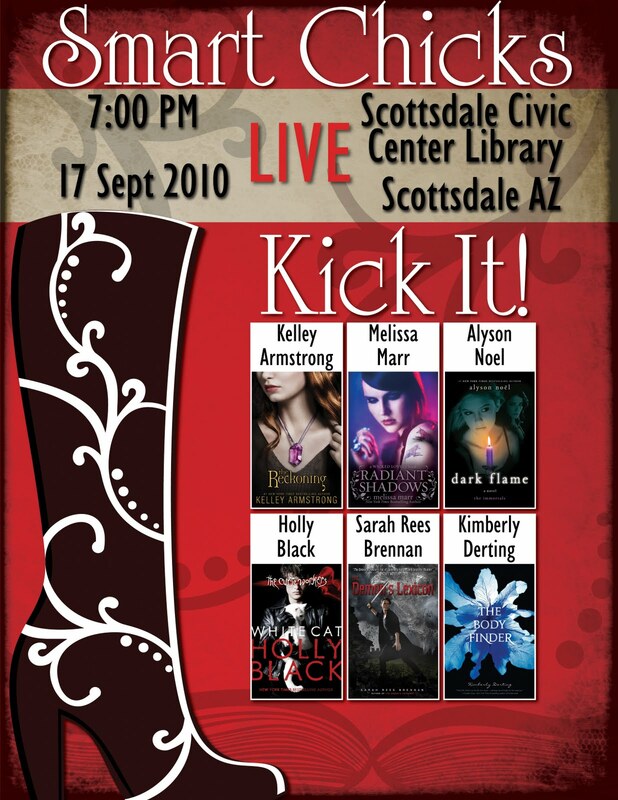 The Smart Chicks Kick It Tour continues in Scottsdale, AZ today! for a special event hosted by POISONED PEN! Can't wait to see you there! Oh, and here's some footage of the kick off event in Austin, TX--enjoy! Smart Chicks Kick It in Jackson! 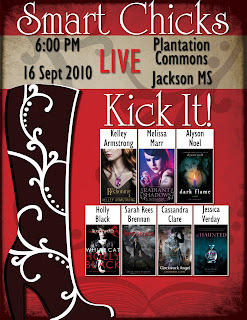 Jackson, MS for a special event hosted by LEMURIA BOOKS! I'll be there--along with Kelley Armstrong, Melissa Marr, Holly Black, Cassandra Clare, Jessica Verday & Sarah Rees Brennan. We hope to see YOU there! The Smart Chicks & More!! Well, the KISSES FROM HELL anthology was released a couple weeks ago (Kelley Armstrong & I have been signing a lot of copies on the road! ), and a couple of the authors put together a fun little video about the pros and cons of dating a vampire. And I just want to assure you before you view it, that despite the bloodshed, no one (other than an old white shirt that no longer fit!) was injured during the filming! Enjoy!! Also, I want to give a shout out to some awesome new fan art that's come in--you guys amaze me with your talent--thanks so much! And, the Smart Chicks Kick It Tour is off to a completely amazing start! The crowd in Austin were amazing, and last night at the B&N in the Woodlands was no different! Just wanted to thank all of you who came out--we had a blast and I hope you did too!! I'll let the pictures tell the rest of the story! 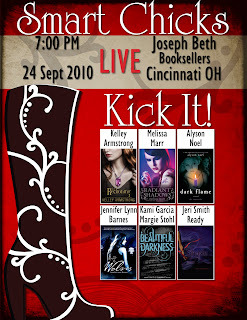 See you tonight at The Refuge (hosted by Blue Willow Books) details HERE!!! Smart Chicks Kick It in Houston- twice!! Last night's Smart Chicks kick off in Austin was EPIC!!! Thanks so much to the hundreds of you who showed up and made the night so much fun!! We left behind lots of signed stock--including signed copies of the SHADOWLAND paperback which was released yesterday!! !--so be sure to contact Book People if you're interested in an autographed book! 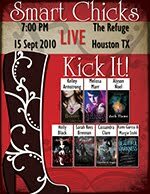 And then on Sept 15, Kelley Armstrong, Melissa Marr, Holly Black, Sarah Rees Brennan, Cassandra Clare, Kami Garcia, Margie Stohl, and I will be headed to The Refuge to take part in an even hosted by Blue Willow Books! Smart Chicks Kick It in Austin!!! 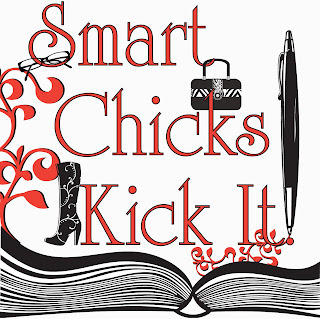 Today marks the start of the Smart Chicks Kick It Tour!!! Kelley Armstrong, Melissa Marr, Holly Black, Rachel Caine, Cassandra Clare, & I will be appearing at BOOKPEOPLE in Austin, Texas at 7:00 PM-- & we really hope to see you there!! More RADIANCE & Tour/Travel News!! Just wanted to share a nice little RADIANCE mention that'll be in this Sunday's LA Times that you can read online HERE. And for those of you wanting to see the RADIANCE spots on TV--be sure to tune in to ABC Family on Saturday at 5:35 PM during the movie, Kangaroo Jack, and on Sunday at 11:12 AM during the movie, Ice Age (times are Pacific standard)! Also, I've been jumping at the bit to announce this--and now I can! Just a few days after I return from the Smart Chicks Tour I'll be heading to London and Frankfurt! Monday, October 4, 10:00 am Wimbledon Book Festival event --details coming soon! 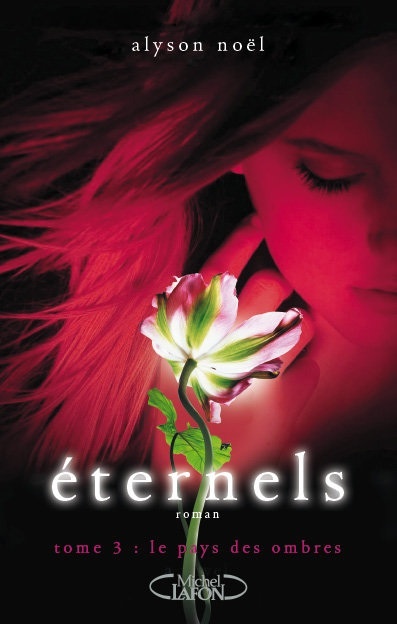 Tuesday, October 5 , Central London teen reading/book group event --details coming soon! For those of you who speak German there was a piece in the Buchjurnal Magazine that you can see HERE, also please visit the Immortals website HERE! More info will be coming in soon, but we're off to a great start, I can't wait to meet my UK & German readers!! Wow, there is so much going on right now, it's hard to know where to start, so if it's okay with you, I think I'll just jump in and see where I land! First off: Just want to THANK YOU all again for your wonderful support of RADIANCE!! I know I've gone on (and on!) about how Riley holds a special place in my heart, and I just want to say that your support of her story (which propelled her to #2 on the New York Times Bestsellers list! 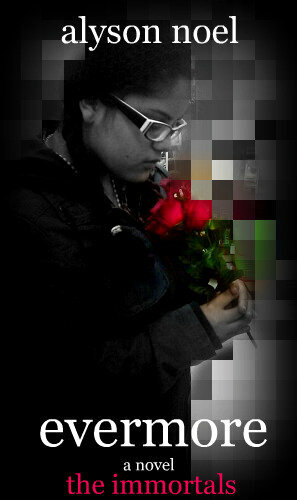 ), really means the world to me! Also, if you haven't yet voted in the Teen Reads Awards be sure to do so! 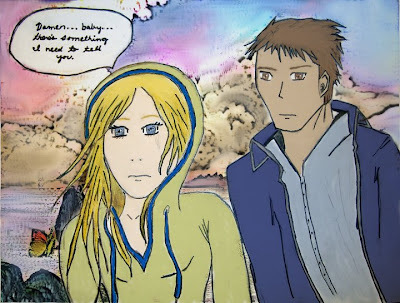 SHADOWLAND is up for "Best Teen Read" and all you have to do is click HERE to see the other awesome nominees and vote! But be sure to hurry--voting ends Sept 12! 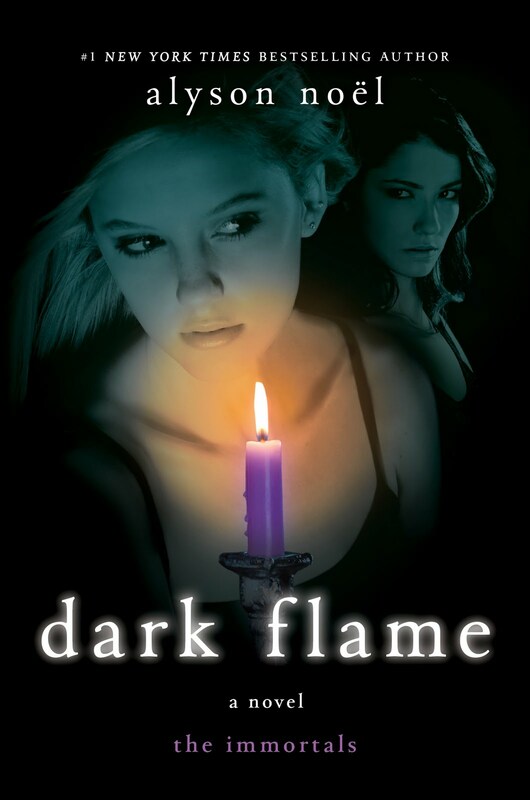 Oh, and I just learned that DARK FLAME made Borders Books "Best Books of 2010" List--woo-hoo! You can see the full list HERE! And, I can hardly believe it's upon us after so many months of planning/anticipation, but as of Monday the Smart Chicks are hitting the road and I'm telling you it's going to be EPIC! This tour really has it all: an amazing group of authors, signings, Q&As, Swag (! ), good times, and, hopefully, YOU!! The stops are all here, but feel free to visit the Smart Chicks Website for more details! Melissa Marr, Alyson Noel, Kelley Armstrong, Mary Pearson, Rachel Caine, Rachel Vincent, Carrie Ryan, Margaret Stohl & Kami Garcia. Right after the Chapter's signing I'll be heading over to the Teen Read Awards Big Event--details HERE! Oh, and for those of you who can't make it--or just want to relive it--we'll be posting pictures on the Smart Chicks Blog and sharing all the inside scoop, so be sure to check it out! Also, there are posters available for download that you can bring along to each event and have signed! Whew! I think that about covers it--have a great day, everyone! RADIANCE is a New York Times Bestseller!!! Thank YOU Thank YOU Thank YOU for all of your kind words, enthusiasm, and support of Riley & Buttercup's story!! I couldn't do it without YOU!!!! Wow. Things have been crazy/busy here at Casa Noël. I'm wrapping up the final book in THE IMMORTALS series (yes, we finally have a title--I'm just waiting to announce it), wrapping up the summer (can't believe it's almost over! ), still unpacking from our move (the boxes are multiplying! ), gearing up to head off on the Smart Chicks Tour (hope to see you on one of the stops! 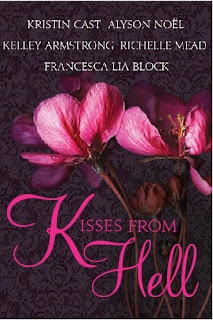 ), and, in the midst of all that, the KISSES FROM HELL anthology was released last week! 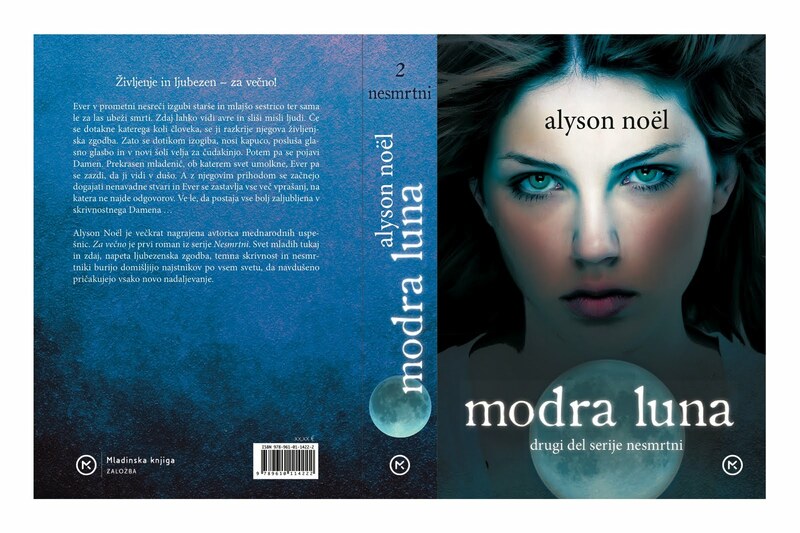 "Alyson Noel’s Bring Me To Life is particularly enthralling, with a setting reminiscent of old British romances like Wuthering Heights and a creepy, unrelenting fog that will chill your bones." "I must admit there is not one thing I don't like about this book. I just listed all the pros and there are no cons. I would rate it FIVE STARS." Okay, there's probably more, but that's all I can remember at the moment due to all the busyness, so I'll leave it at that and say--have a great night! !